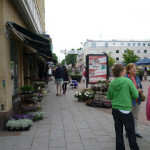 Finns can’t cope with ice – shock! 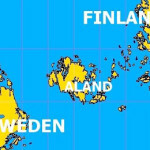 I’ve had some disturbing news from Finland: some 50 vessels of various kinds are stuck in the ice around the Åland Islands in the Baltic Sea between Finland and Sweden. During the most severe winter weather Northern Europe has experienced, this sounds a perfectly reasonable state of affairs. Expect it isn’t. Finns are used to severe snow and ice, they always cope with it. They are one of the leading manufacturers of ice-breakers, large ships that keep the shipping lanes free from ice.Besides, we eat rye bread, drink vodka and fight with knives. Surely a little bit of ice isn’t a problem? Last night even the ice-breaker struggled to free a Viking Line ferry. This boat, fondly named Ålandsfärjan, takes passengers from the Island to Stockholm through the narrowest bit of the Ålandshav several times a day. It’s more like a commuter ferry. It’s the route we take when we go to the Island, and is used weekly by my Mother. For the ferry to stop operating is the biggest headline the local paper, Ålandstidningen, has ever had. Their normal fodder is drunken disorderly Finns causing havoc to the peace-loving islanders. What has happened to my country?????? I have some very good friends whose family are in Sweden and they said this winter has really taken everyone by surprise. They brought amazing pictures back from their hols of the frozen sea- actual frozen waves- I've never seen anything like that. Am constantly amazed by how well nordic countries function in the terrible weather- and embarassed about how badly we do. At least there is enough ice for our drinks now! Little Man enjoyed the video and was fascinated by the story, as was I, of course! Your comment at the end did make me smile – and on a Monday too!